2016 has been another fantastic year at Famous Audio. We’ve released over 20 products across many genres – well, let’s stop for a second and remember what we did in 2016. There is something for everyone – from Future Bass to Electronica, DnB to RnB, Ambient to Hip Hop, EDM to UK House, Dubstep to Chillout. ‘Best of 2016’ is a huge arsenal for every producer looking for Loops & Samples, MIDIs, Softsynth Presets and Inspiration Kits, features 2.45GB of sample material hand-picked from a selection of our most popular sample packs released in 2016, collected together to create one neat package for anyone needing the essential ingredients to quickly build a chart-topping track. 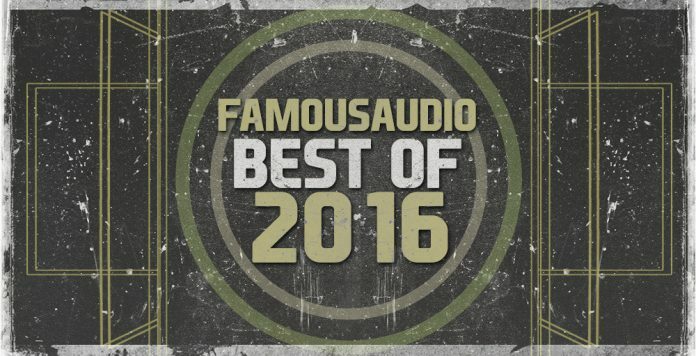 Famous Audio Best of 2016 comes stacked with cone-melting elements to destroy the dancefloor. From sinuous basses to modulating reese leads, soaring pads to supersaw poly synths, chest pounding drum loops to skull smashing drum hits, dark otherworldly textures to frantic percussions, unreal and magical atmospheric pads, mysterious wind ambiences to deep and moody soundscapes, creepy and eerie backgrounds to dark otherworldly textures, tension-wrenching synth-pads to dark stylized cinematic sounds, hardest hitting and booty-shakin’ drums to screeching electro leads, boomy 808 kicks to quirky bleeps, dusty double basses to processed flutes, vinyl & tape flavoured hip hop drum samples to gorgeous live instruments, sub-soaked wobbles and heavy FM bassline to jack-injected beats, tech-infused glitches to huge analogue rave synths, vibrant horn stabs to chunky futuristic beats, grimy chants to cracking grooves, complex piano arps to dark emotional chord progressions, big melodic pads to blazing synths, funky piano grooves to smooth chord progressions, soulful house stabs to sizzling SFX and more… You will have all the material you need to create exciting, mind-blowing tracks – you can use them in any way you want to add creativity to your killer productions. This mammoth collection contains all the key ingredients needed for producing your next major dance floor smash! It’s over 2.45GB of size, 1154 files and it has everything you can imagine: Inspiration Kits, Loops, One-Shots, MIDI files and Presets. Including sounds from Atmospheric Chill, Atmospheric Chill Vol 2, Cosmic Ascension, Live Series: Chilled Flutes, EDM Drops Vol 2, EDM Trap, Futuristic Hip Hop & Experimental Electronica, Intelligent Hip Hop, Lunatic DnB, Future Memories and UK House & Bass. All sounds are organised into folders for easy access and can be used in your productions! Everything you need to produce complete tracks from the ground up or embellish your existing productions is in this pack..
Now you can get your hands on this collection!